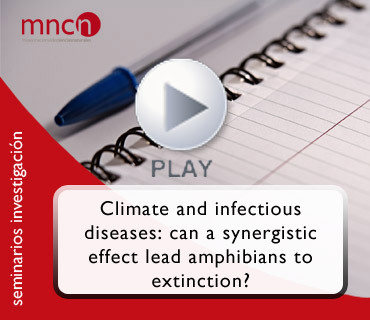 Research seminar: CLIMATE AND INFECTIOUS DISEASES: CAN A SYNERGISTIC EFFECT LEAD AMPHIBIANS TO EXTINCTION? Seminario de investigación: EL CLIMA Y LAS ENFERMEDADES INFECCIOSAS. PUEDE EL EFECTO SINÉRGICO DIRIGIR A LOS ANFIBIOS A SU EXTINCIÓN? Chytridiomycosis, is a skin disease in amphibians caused by a pathogenic chytrid fungus, Batrachochytrium dendrobatidis (=Bd), that has been associated to amphibian extinctions and declines all over the world. This recent amphibian crisis has sparked a realm of interdisciplinary research that has brought about insight on intriguing relationships. For example, we know that climate warming can increase pathogen development, disease transmission rates, and vulnerability of amphibian hosts. We have been studying the impact of Bd in Puerto Rican anurans for the past 14 years in relation to several environmental factors. Analysis of weather data for the past 40 years revealed that climate change in the Caribbean has brought expanded periods of drought, and a significant increase of mean minimum temperature in mountain ecosystems, potentially intensifying the severity of dry seasons. In addition, we found that susceptibility of direct-developing frogs to this pathogen is associated to seasonality, with the highest infection intensities observed during the cool-dry (vs the wet-warm) season. Considering that Bd disperses via flagellated spores, this sounds counter-intuitive. However, a combination of factors that influence host’s behavior, physiological stress and immune response, renders this opportunistic pathogen an advantage under these climatic conditions. In this seminar I will share investigations in my lab that have lead to uncover synergistic mechanisms between tropical climate and disease that may cause certain species of amphibians to go extinct, others to decline in specific localities, and yet others to persist in spite of low to moderate pathogen loads. At a time when climate warming is expected to increase, it is important to understand how it interacts with other environmental factors that may exacerbate the risk of biodiversity. Presentación: Ignacio de la Riva. Dept. Biodiversidad y Biología Evolutiva, Museo Nacional de Ciencias Naturales, CSIC. Ponente: Patricia Burrowes de la Universidad de Puerto Rico, EEUU. Seminario organizado por el Departamento de Biodiversidad y Biología Evolutiva del Museo Nacional de Ciencias Naturales (MNCN), CSIC, y retransmitido en directo a través de Cienciatk.